Church is first and foremost a gathering of people with a purpose. Church is a community. At Coventry Vineyard, we want to be real people living real life. We want to understand what it means to belong to one another, and be devoted to one another in love. (Romans 12:10). We are better together. We are better people when we do life together. Life is better, richer, more fulfilling when you do life with others. This series also introduces our new Life Groups. For more on Life Groups click here. 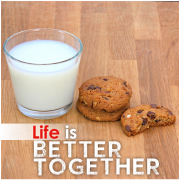 Life is better together. What does community look like and how do we encourage one another to live "real life". Loneliness is epidemic. How can church be a place where people can belong? We all have people who hurt us. How do we forgive others and be reconciled to them? Who is church for? Who is welcome? Who is invited to belong? We all value good character. In others. As followers of Jesus our character should be changing. We want our character to reflect His character. This series is not about making you a little bit better, it's about transformation, it's about how to become more like Jesus and reflect God's character to others.